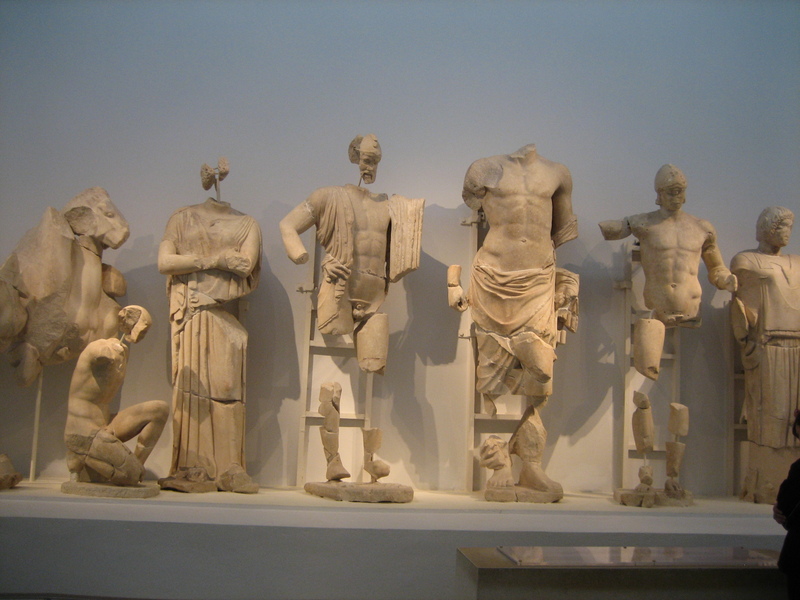 The picture above is of a sculpture from the western pediment of the Temple of Zeus in the Ancient Olympia Museum. It depicts the abduction of the Lapith women by Centaurs and has Apollo as its central figure. 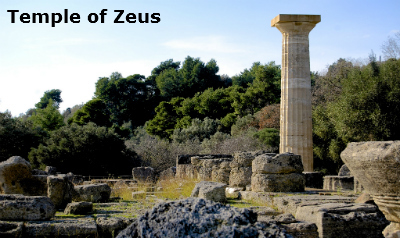 This is one of the most important ancient sanctuaries, dedicated to the father of the gods Zeus. 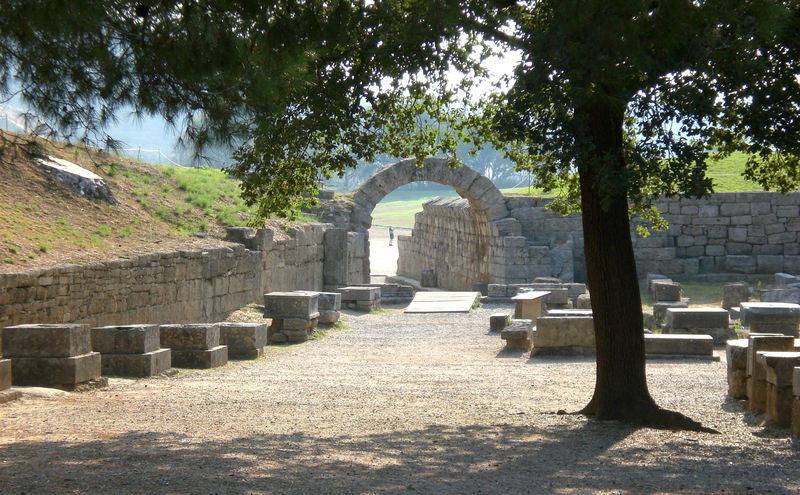 The Olympic Games began at Olympia and it was where they were held. The area has been continually lived in since the 3rd millennium BC and became a religious centre in the late Mycenaean period . The sanctuary of Olympia, situated in the west of the Peloponnese, spreads around the green wooded base of the Kronion hill where the rivers Alpheios and Cladeos meet. The valley in between the two rivers was full of wild olive trees, poplars, oaks, pines and plane trees and it was these that gave the center of the sanctuary the name Altis, meaning alsos (grove). 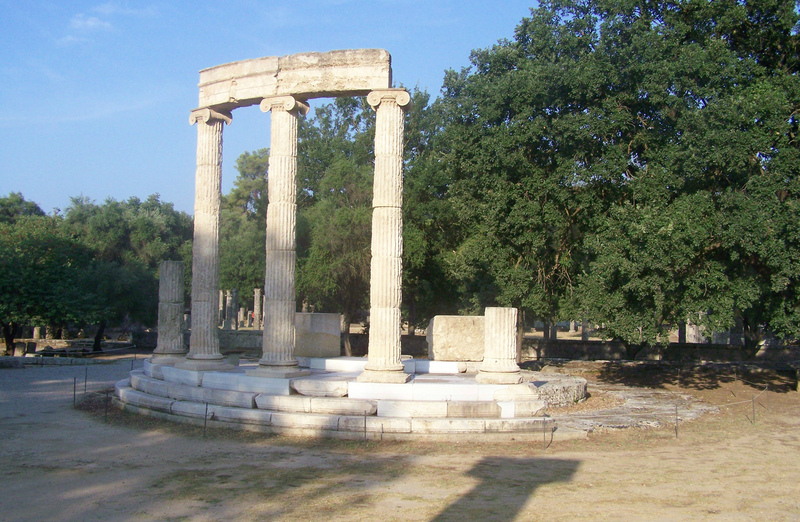 French archaeologists began excavations at Olympia in May 1829, two years after the battle of Navarino. The finds were transferred to the Louvre in Paris where they are still being exhibited. The excavation was halted when the Greek government was told of the looting of artifacts, and excavations were started again 45 years later by German archaeologists. The research is being continued to this day by the German Institute of Archaeology in Athens and the Ephorate of Antiquities in Olympia. 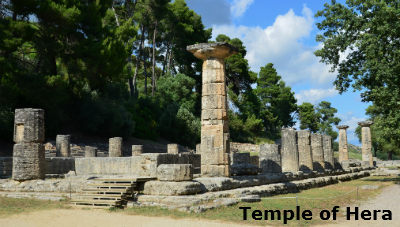 The Temple of Hera is a Doric temple from the end of the 7th century BC. The Heraion is one of the oldest examples of temples in Greek architecture and the most intact structure of the site. Originally made of wood, it was a richly ornamented large building with a three-aisled main room where the statues of Hera and Zeus stood. Traditionally this is where the Olympic Flame is lit. The gymnasium dates from the 2nd century BC. South of here is the partly restored palaestra (wrestling school), where contestants practised and trained. From the 5th century onwards, the sanctuary assumed its final form with the impressive temple of Zeus, the Metroon, the Arcades, the Gymnasium and the Palaestra, the living quarters of the priests, and the Philippeion. 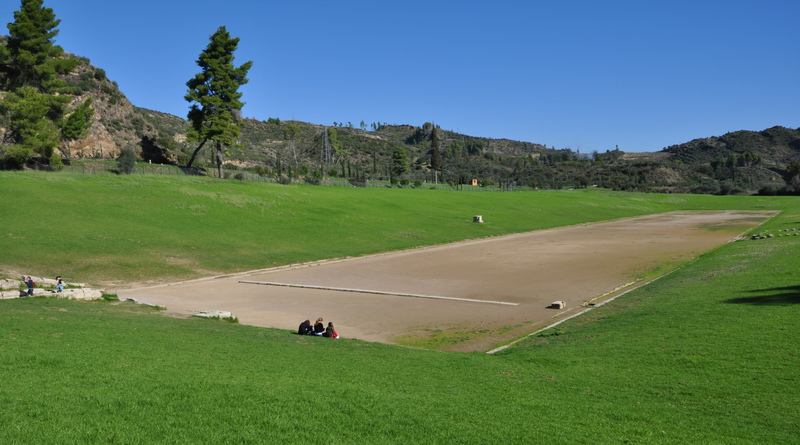 Olympia was an ancient Greek sanctuary site dedicated to the worship of Zeus, in whose honour Pan-Hellenic Games were held every four years from 776 BC to 393 AD. 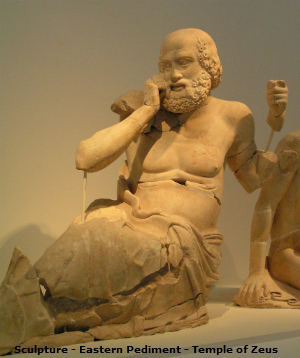 It was said that the Olympic Games began after a victory by Pelops against Oenomaos, King of Pissa. 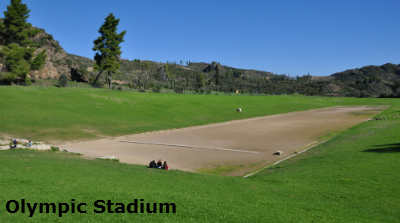 The stadium in its present form dates from the early 5th century BC. The track has a length of 212.54 metres and a width of 28.50 metres. Access to the stadium by the athletes was by a vaulted entrance thirty-two metres long. The start and finish lines of the 120m sprint track and the judges' seats still survive. The stadium could seat at least 45,000 spectators. Slaves and women spectators had to be content to watch from the Hill of Kronos as only men were allowed into the Stadium. 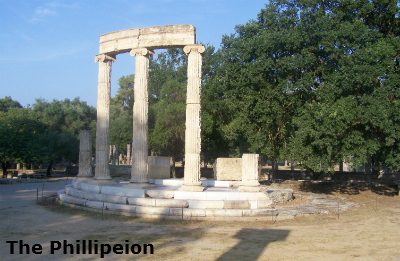 To the north of the Temple of Zeus was the pelopion, a small, wooded hillock with an altar to Pelops. It was surrounded by a wall containing the remains of its Doric portico. Many artefacts now displayed in the museum were found on the hillock. 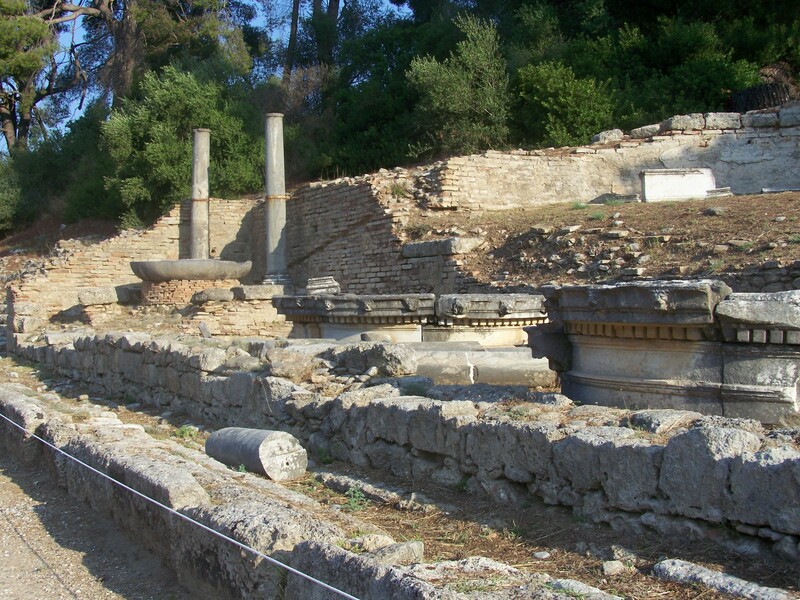 The foundations of the Philippeion, west of the Temple of Hera, are the remains of a circular construction with Ionic columns built by Philip of Macedon to commemorate the Battle of Chaironeia (338 BC), where he defeated a combined army of Athenians and Thebans. The building contained statues of Philip and his family. Directly opposite the temple of Zeus, was the workshop of Pheidias where the great sculptor carved the huge statue of Zeus, listed as one of the Seven Wonders of the ancient world. 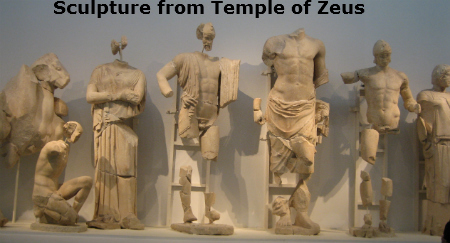 The statue was probably transported in pieces and assembled inside the temple of Zeus. It depicted Zeus seated on a gold throne decorated with mythological scenes; the face and undraped parts of the body were of ivory, while the gold robe was adorned with glass flowers and semi-precious stones. Excavation finds and pottery date it precisely to 430-420 BC. 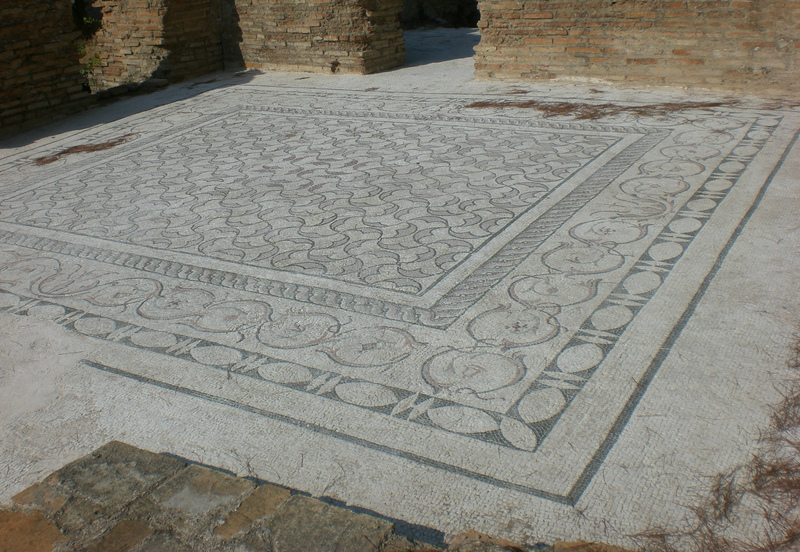 Later the workshop became a place of worship and in the fifth century AD, a Christian basilica was erected over its ruins. The nymphaeum, built by the wealthy Roman banker Herodes Atticus in AD 156-60 was very grand, consisting of a semicircular building with Doric columns flanked at each side by a circular temple. 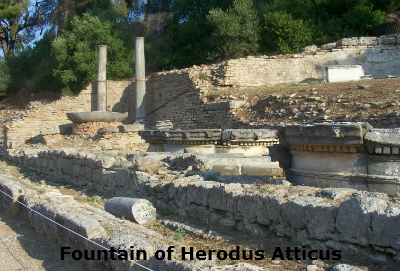 The building contained statues of Herodes Atticus and his family. Despite its elaborate appearance, the nymphaeum had a practical purpose; it was a fountain house supplying Olympia with fresh spring water. 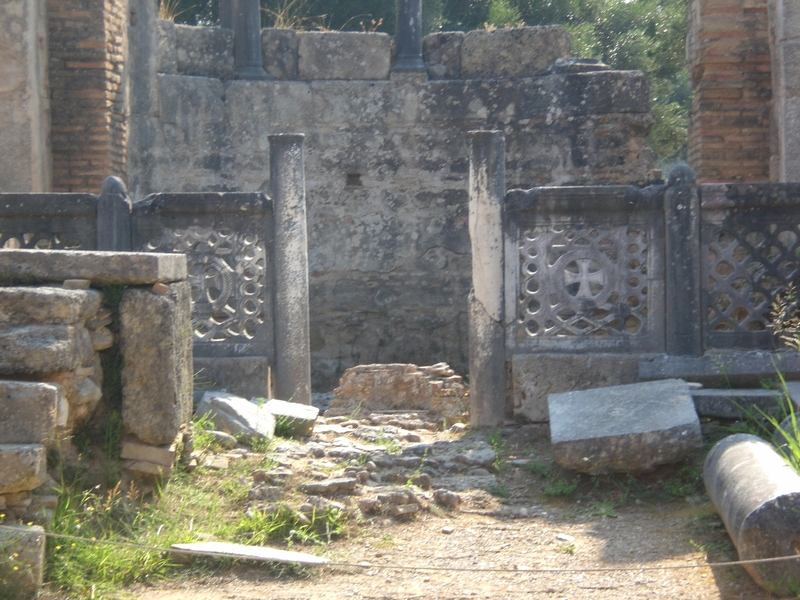 In Roman times, the villa of the Roman emperor Nero was added, also the Exedra of Herodes Atticus and Roman baths, and even then when it was at its largest,Olympia was no more than a square kilometer in size. The Olympic Games ceased in 393 A.D. after the edict issued by Theodosius the Great which forbade all pagan festivals. The Games were revived for the first time after fifteen centuries, in 1896, in the marble stadium in Athens. 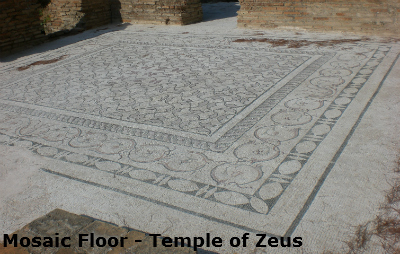 The Temple Of Zeus was built between 470 and 457 BC. and it is widely accepted to represent the best example of classic Doric architecture , which enshrined the statue of Zeus, later removed to Constantinople by Theodosius II (where it was destroyed by fire in AD 475). One column has been restored and re-erected, and helps put into perspective its sheer size. After the games had come to an end in the early fifth century in 522 and 551 the ruins were devastated by earthquakes, the Temple of Zeus being partially buried. In subsequent centuries the rivers overflowed and together with landslides buried the site in mud and sand. 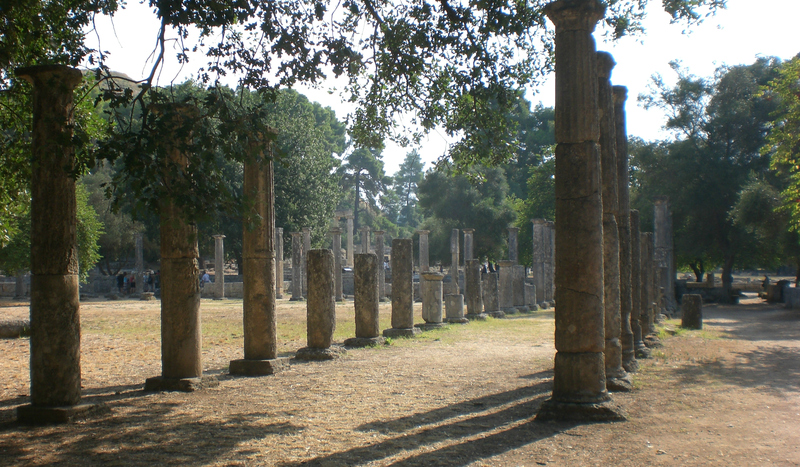 Olympia remained forgotten under a layer of debris 5-7 metres deep and was not rediscovered until 1766 by the English antiquarian Richard Chandler. 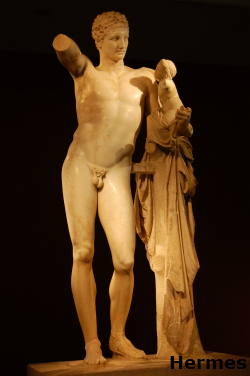 One of the masterpieces of ancient Greek art, Hermes is depicted carrying the infant Dionysos. It is made from Parian marble and is 2.10 meters high. It is thought to be an original of the great sculptor Praxiteles and it is dated to ca. 330 BC. The statue depicts a winged woman. An inscription on the base states that the statue was dedicated by the Messenians and the Naupactians for their victory against the Spartans in the Peloponnesian war, around 421 B.C. It is the work of the sculptor Paionios of Mende in Chalkidiki. 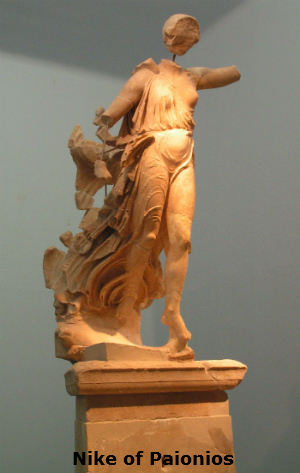 Nike, cut from Parian marble, has a height of 2.115m, but with the tips of her (now broken) wings would have reached 3m. In its completed form, the monument with its triangular base (8.81m high) would have stood at the height of 10.92m. 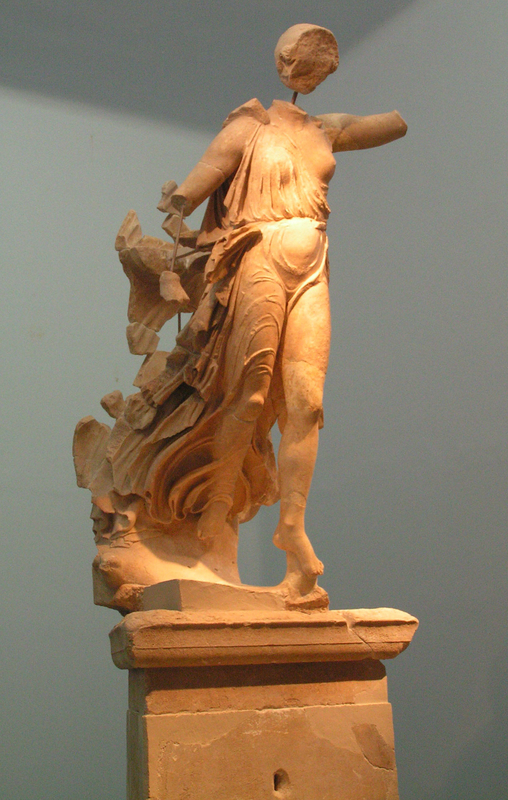 giving the impression of Nike triumphantly descending from Olympos. The eastern pediment depicts the chariot race between Pelops and Oinomaos and the central figure which dominates the work is of Zeus. 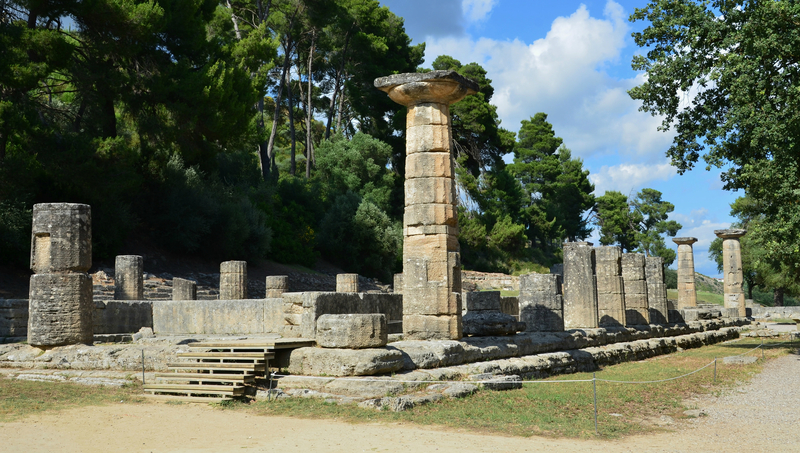 If visiting Olympia during the summer months it is a very good idea to begin very early - the site opens at 8am and is not really busy at that time as a lot of the coaches have not arrived. Following the devastating fires in the Peloponnese in 2007, although they managed to save the site itself the whole area around the site was badly affected. Before the Olympic Flame was lit for the 2008 Olympics there were over 30,000 trees planted around the site. 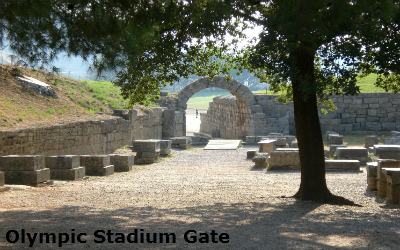 The image that depicts Olympia for me is the gateway into the Stadium. It is an awe inspiring sight.